Cairns beachfront accommodation at Yorkeys Knob; 15m north of Cairns' city centre in Tropical North Queensland, Australia. Enjoy ocean-facing 4 star luxury holiday apartments with each apartment featuring a spacious balcony or private garden courtyard. The web server with the IP-address 203.1.69.16 used by Cairnsbeaches.net is run by Internet Information Group and is located in Australia. This web server runs 7 other websites, their language is mostly english. 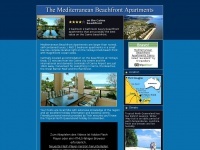 The websites of Cairnsbeaches.net are served by a Apache web server using the operating system Ubuntu (Linux). The software used to serve the webpages was created by using the programming language PHP. HTML 4.0 Transitional is used as markup language on the webpages. The website does not specify details about the inclusion of its content in search engines. For this reason the content will be included by search engines.